Join us for a film screening and discussion of Bill Callahan's "Great Walls: Journeys from Ideology to Experience... and Back Again"
"Great Walls" examines the politics of walls by using the Great Wall of China to rethink both current border walls (the Trump Wall, the West Bank Barrier) and iconic walls (the Berlin Wall). It examines how walls serve as sites of ideology, both Cold War ideology and anti-immigrant ideology. It also examines how walls are sites of experience in every life by juxtaposing archive clips of political leaders and ethnographic film of ordinary people. The film utilizes walls to ask how personal experiences shape ideology and vice versa. Master of Arts and Doctor of Philosophy in International Development Studies (MAIDS-GRID), Chulalongkorn with Bachelor of Political Science Program in Politics and International Relations (BIR), Faculty of Political Science, Thammasat University and Master of Human Rights and Democratisation (Asia Pacific), Institute of Human Rights and Peace Studies (IHRP), Mahidol University is arranging an International Conference on "Graduate Studies in the Disruptive Society: Innovation in Human Rights, Development Studies, and Resource Politics" on 12-13 July 2018 at Faculty of Political Science, Chulalongkorn University. Time: 09.00 - 12.00 hrs. "Program Coordinator (Academic Affairs Officer)"
8. Arranging international activities within the program and with other partners and potential partners such as seminars, workshops, public lectures, etc. 9. Uploading activities and posting program’s activities on our channels such as website, Facebook, etc. 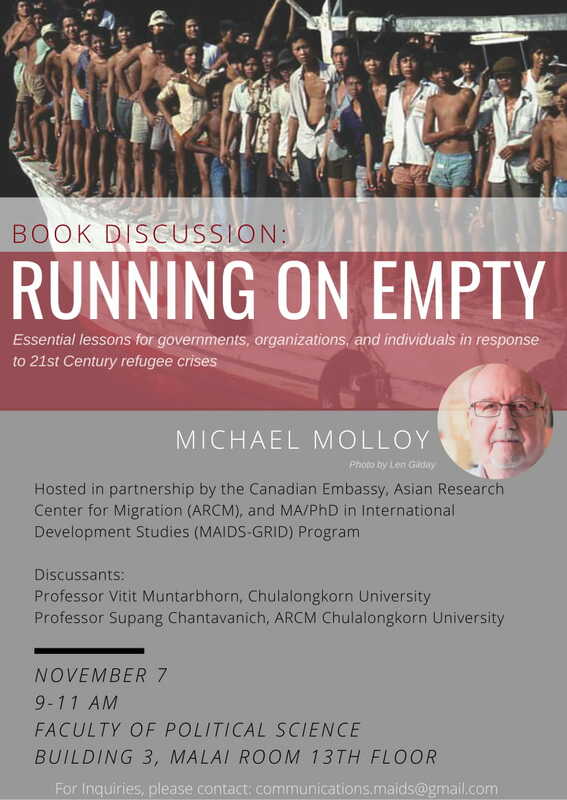 Migration management of migrant workers and refugees is one of the issues many countries talk about. Migrations along borders have been continually happening. However, significant controls ex. By passport or by visa happened when countries were developed to modern state. We can see big migrations after the war since World War II when the Jewish tried to flee from genocide. Human rights and humanitarian reason support the migration to developed countries ex. USA or Scandinavian counties in Europe. USA is one among other countries that migrants wish they could go for better life with their open policy that allow foreigners with some specific conditions to resettle in the country and to apply for citizenship. Migrants who travelled to the USA may be originally from their origin country of from the country they temporarily stayed before. There are many reasons that could cause the migration ex. problems about political opinion, war between each euthenics, religious issues, etc. In USA, there is a Department of Homeland Security who screens and makes decision of those who apply to stay in the country. Also, there is a United State Department of Labor who is a main agency to manage migrant workers who come to work in the US. Definitions of refugee and migrant worker are different. However, both refugee and migrant worker move from their country to stay in another country with some problem in their home country. Migrant worker migrates for economic reason and to find a better life when refugee flees from their home country because of persecution(s). Once they arrive in the US, both of them will be brought into a system that aims to protect their lives and their human rights under. We will also talk about the New York Declaration of the United Nations (UN) which is related to our topic, migration management roundtable: case study: USA. We hope that this roundtable will open a space to discuss and share thoughts on migration management system in a developed country. Time: 08.30 - 13.00 hrs. Internet of Things, and digital marketing are also highlighted to have transformative impacts on jobs in ASEAN. Notions such as ‘nature’ or ‘culture’ are the product of a particular historical process and express the specific distribution of ontological properties to beings in the world that the Moderns have devised. Other civilizations have adopted other systems of distribution, resulting in ontologies and principles of association between humans and non humans that differ widely from the one which emerged in Europe a few centuries ago. The challenge for the social sciences is to acknowledge this diversity, while retaining the ambition to explain it in non Eurocentric terms. "Three Keys Issues in the New International Trade Landscape for South East Asia"
As a member of the OECD Trade and Agriculture, Directorate’s senior management team, Ms Nielson supports the Director in delivering the strategic orientations of the Secretary General to advance the implementation of OECD advice in members and partner countries in the areas of trade and agriculture and to ensure effective engagement with stakeholders and partners both inside and outside the Organisation, including major emerging economies. Specifically, Ms. Nielson leads the work at the interface of trade, agriculture and development policies by providing evidence-based policy advice on a range of policy issues, including trade facilitation, global value chains, the digitalisation of economy and society (DES), agricultural policy reviews for developing countries, food security and risk management. She recently led the Trade Directorate's work on responding to the anti-trade backlash. Abstracts can be downloaded here. Conference details are available here. Over the past few decades, the concept of human security and policy implementation has constantly faced challenges and criticisms. Among others, the 9/11 attacks particularly persuade many that traditional (state-based) security should be at the core of international relations debates. These debates call for the mobilization of military efforts to curtail the widespread of global ‘terrorist cells’ at the expense of overlooking social, economic and political conditions that provide fertile ground for the acts of terror. Participants in these acts are often from the marginalized parts of the world where resources are monopolized by the local and global elite class. More importantly, they emerge from territories occupied by foreign powers whose collaboration with national leaders exacerbate the oppressive situation. Even though this is not the case for every ‘perpetrators,’ one can still argue that a crucial justification for their acts of terror originates in the globalised state of human insecurity – be it exploitation, inequality, prolonged civil war, and dismissed rights to express one’s identity. It is necessary to bring back debates of human (in)security in connection with ongoing threats to state security. Without reviving this connection, it is unlikely that we would arrive at a comprehensive understanding as to why acts of terror have increasingly become the weapon of choice that has killed 30,685 lives in 2014 alone; what drove participants in cruel attacks in France, Belgium, Nigeria, Turkey, Pakistan, Iraq, Australia, Somalia, Lebanon and Indonesia; what are the justifications for the use of indiscriminate violence by fundamentalist groups; how civil wars have created waves of refugees; and how the failure in reforming global economy has precipitated economic disparity between the rich and the poor, and how this economic phenomenon is interpreted in a discourse of oppression that urges armed and unarmed resistance to it. Put differently, addressing and tackling the current state of global (in)security requires the understanding of the interwoven relationship of global peace, development, human rights and democracy. The International Conference on International Relations and Development (ICIRD) is one of the key activities organized within the framework of the ICIRD Knowledge Network. The main objective of the conference is to provide a forum for debate between scholars, practitioners, civil society and community representatives on current development, international relations and human rights trends in Southeast Asia, with a particular focus or themes which differ from year to year. The International Conference on International Relations, Development and Human Rights (ICIRD) will held in Bangkok, Thailand, on 23-24 June 2017, which aims at engaging its participants in the discussion and debates which seek the relevance of different aspects of human (in)security with contemporary global issues, especially the current state of international security. Welcome to MAIDS-CSDS Co-Working space located on the 2nd floor, Building 2, Faculty of Political Science, Chulalongkorn University. It is now open from 09:00 am. to 04:00 pm. Monday to Friday. Textbooks, previous theses, and researches are available to borrow. A coffee corner is coming soon! This co-working space is open to all lecturers, researchers, staffs, and students as well as almuni of MAIDS and CSDS! 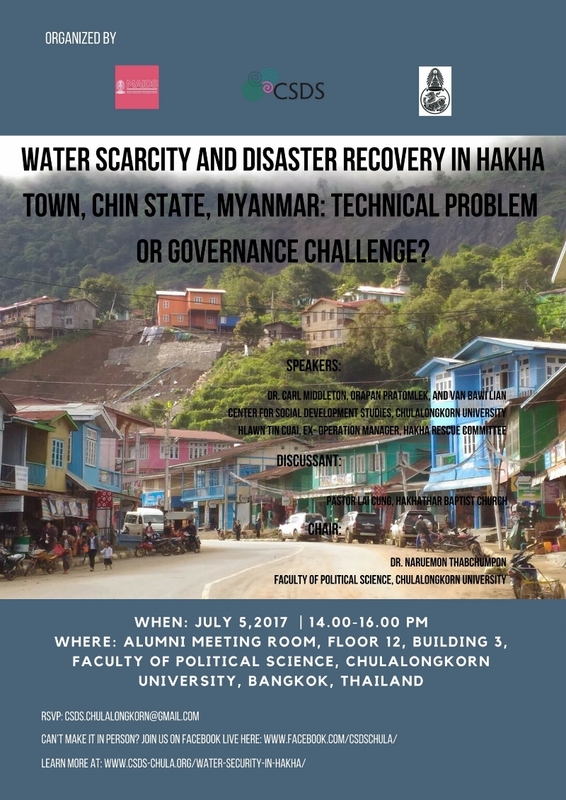 You are cordially invited to the Public Seminar on "The Politics of the 2011 Bangkok Floods" by Dr. Danny Marks (UCRSEA Postdoctoral Research Fellow, Asia Institute, University of Toronto; and Research Associate, Center for Social Development Studies-CSDS, Faculty of Political Science, Chulalongkorn University.